Portrayed as an old man in accordance with the conventional method that was faithful to prevailing iconographic precepts, in his right hand the god Saturn clasps a scythe, his inveterate attribute, using it to steady himself. At the same time, with impressive bestial energy, he leans over a boy, into whom he sinks his teeth to devour him, while the defenceless creature attempts to kick himself free, writhing and screaming for help, and directs his anguished gaze at the viewer. The stars in the firmament above the cruel old man remind us that Saturn is also the name given, back in antiquity, to the sixth planet in the Solar System that is visible to the naked eye. However, this is an odd arrangement: beside the main gleam of light are two smaller stars whose presence is not quite clear. It is now known that Saturn is surrounded by a ring that can only be seen with a telescope. When Galileo Galilei discovered this phenomenon in 1610, he believed that the ring was two satellites positioned on either side. 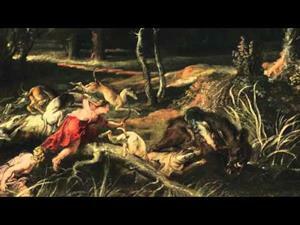 Was perhaps Rubens familiar with this interpretation? 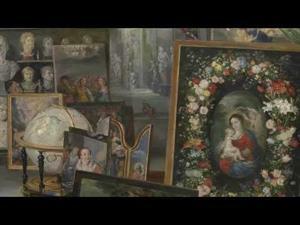 Certainly, the painter followed all the advances of his age with extreme interest; however, this hypothesis would have to be examined at length in order to be given serious consideration. 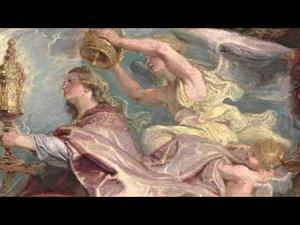 Even so, the idea is not far-fetched, as Rubens was in the Eternal City during the period in which the famous sage worked. Saturn was also the ancient Italic god of agriculture. And in very ancient times he was identified with Cronos, the son of Uranus and Gaea, the personification of Time, and with the Greek god of the same name, the youngest of the Titans. He and his wife Rhea reigned on Earth, which was then enjoying the benefits of a splendid Golden Age. To prevent his sons from seizing the throne from him, as he himself had done with his father, he decided to kill them all by devouring them as soon as they were born. The desperate Rhea devised a plot: when she gave birth to a new son, Zeus, she handed her husband a rock wrapped in swaddling cloths instead of the newborn. 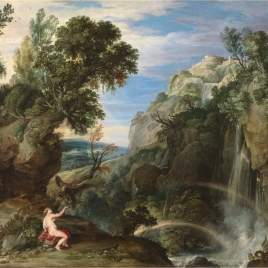 The trusting Saturn gobbled up the rock without discovering the trick, while the baby was hidden on the island of Crete. 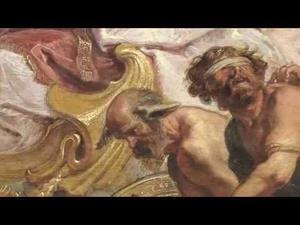 Later, when Zeus was a man, he defeated his father and forced him to vomit his offspring, earlier victims of his repulsive cannibalism, and expelled him from Olympus. The vengeful deity thus fled to the Italic Peninsula, where he was welcomed as god of fertility and agriculture. One of the best examples of the account of this peculiar legend is found in Ovid´s Fasti. 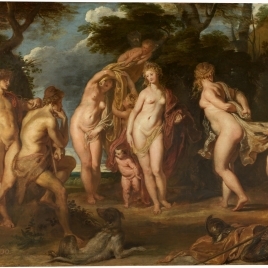 This painting is one of the works executed by the master himself and belongs to the series of large mythological paintings produced between 1636 and 1637, many of which are housed in the Museo del Prado. The set was painted to decorate the Torre de la Parada, the hunting lodge used by Philip IV in the Monte del Pardo woodlands just outside Madrid. 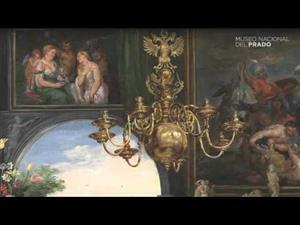 Decades later the splendid paintings became dispersed among other palaces belonging to the Spanish Crown as new residences were built and older ones renovated. 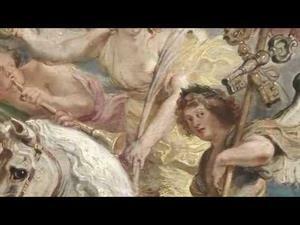 The style is an excellent example of the accomplished, brilliant mature period of Rubens, who succeeds in hinting at the dynamic force of forms and poses without necessarily specifying them in full detail. Indeed, it is a bold and highly effective combination of suggestion and precision, rendered in a language that was modern for the time. He works with sweeping, honest brushstrokes, using solely and exclusively painterly devices, and accentuating light and shade with masterful skill. 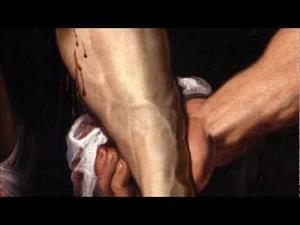 The same technical prowess is found in the corrections that remain visible, for example around the voracious divinity’s right arm and beneath his left heel (From Titian to Goya. Great Masters of the Museo del Prado, National Art Museum of China-Shanghai Museum, 2007, p. 369). Height: 182.5 cm. ; Width: 87 cm. Royal Collection (Torre de la Parada, El Pardo-Madrid, "Sexta pieza"; Torre de la Parada, "Quarta pieza", 1747, no. 44; New Royal Palace, Madrid, "Antecámara de la princesa", 1772, no. 1004; New Royal Palace, "Cuarto de la reina-antecámara", 1794, no. 1004; New Royal Palace, "Antecámara de la reina", 1814-1818, no. 1004; Museo Real de Pinturas a la muerte de Fernando VII, Madrid, "Salón 2º Escuela Flamenca", 1834, no. 254). Corpus rubenianum Ludwig Burchard: an illustrated catalogue, IX, Arcade Press, Londres, 1968, pp. 260. 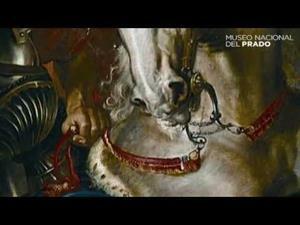 Díaz Padrón, Matías, Museo del Prado: catálogo de pinturas. Escuela flamenca, Museo del Prado; Patrimonio Nacional de Museos, Madrid, 1975, pp. 259. 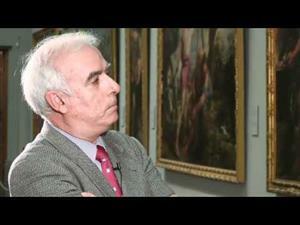 Díaz Padrón, Matías, El siglo de Rubens en el Museo del Prado: catálogo razonado, II, Prensa Ibérica, Madrid, 1995, pp. 940. 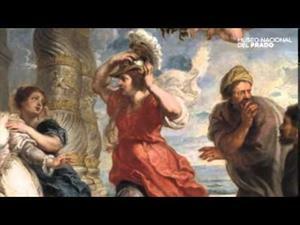 Vergara, Alejandro, The Presence of Rubens in Spain. (Volumes i and II). Tesis D, A Bell & Howell Company, Ann Arbor, 1999, pp. 426. Peter Paul Rubens : Barocke Leidenschaften, Hirmer Verlag, Munich, 2004, pp. 227-230. Georgievska-Shine, Aneta Silver, Larry, Rubens, Velázquez, and the King of Spain, Ashgate, Surrey, 2014, pp. 161,163 Lám.35 fg.6.6. Büttner, Nils., Rubens : Eine Biographie., Verlag Schnell & Steiner GmbH, 2015, pp. 176 f.77. 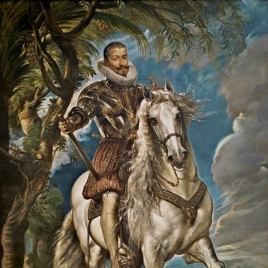 Paolini, C, 'P.P.Rubens. Saturno divora i figli' En:, Rubens e la nascita del Barocco, Marsilio Editori,, 2016, pp. 210-211 n.52. 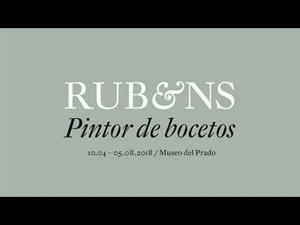 Silver, L, 'Ruben's Myths for the Rey Planeta at the Torre de la Parada' En: The Age of Rubens: diplomacy, dynastic politics and the visual arts in Early Seventeenth century., Brepols,, 2016, pp. 235-249 [248 f.11]. Inv. Felipe V, Torre de la Parada, 1747. Núm. 44. Inv. Carlos III, Palacio Nuevo, 1772. Núm. 1004. Antecámara de Princesa [...] 1004 - 1007 / Torre de la Parada = Dos iguales el vno de Saturno comiendose vn niño y el otro de Jupiter convertido en aguila robando a Ganimedes de dos varas y quarta de caida y vara de ancho escuela flamenca. Inv. Testamentaría Carlos III, Palacio Nuevo, 1794. Núm. 1004. Inv. Fernando VII, Palacio Nuevo, 1814-1818. Núm. 1004. Museo Real de Pinturas a la muerte de Fernando VII, 1834. Núm. 254. Inv. Real Museo, 1857. Núm. 1213. 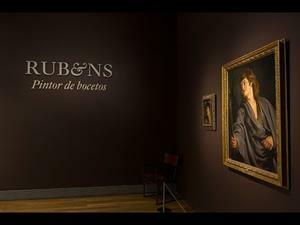 Rubens. / 1213. Saturno. / Esta devorando a uno de sus hijos. / Alto 6 pies, 5 pulg, 6 lin, ancho 3 pies, 1 pulg, 6 lin. Catálogo Museo del Prado, 1873-1907. Núm. 1599. 1599.-(1213-M.)- El dios Saturno, devorando á uno de sus hijos.-Figura entera, de tamaño natural.-Cuadro de decoración. / Col. de Cárlos II, Torre de la Parada. / Alto 1,80; ancho 0,87.-L.